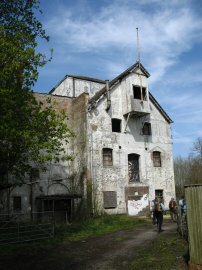 I am walking the Wealdway with a group of friends, walking one stage a month. We did this, the second stage, on Sunday 20th April 2008. 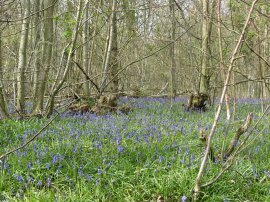 We met up at Blackboys and then took a couple of the cars down to Arlington where we had finished the last stage of the walk. It had been damp when I left Walthamstow and very foggy over the North Downs however by the time we started walking the weather had cleared up considerably and just before we set off I changed out of my waterproofs into a lighter pair of walking trousers which proved to be a good choice as the rest of the day was generally bright and sunny. 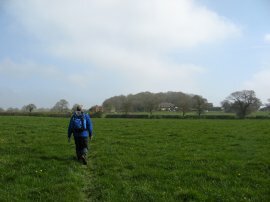 We set off from Arlington Church, photo 1, heading over fields as we made our way towards Upper Dicker. 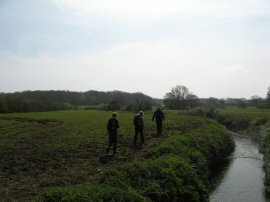 The Wealdway crossed over the Cuckmere River, photo 2, before continuing over more fields, photo 3, towards the village. The fields in this area were generally quite small, at least compared to some of the wide open ones I had been through in Hertfordshire last year, and that meant that there were a very large number of stiles that needed to be crossed at the field boundaries as the path heads past Park Wood and on along the edge of St Bede's Golf course before dropping gently downhill to join the road into Little Dicker. 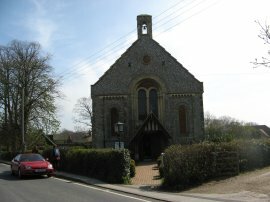 The route runs alongside the road for a short distance, passing the church in photo 4, before taking a footpath that runs off to the right towards the remains of Michelham Priory. However before continuing along this stretch of path most of the group decided to stop for ice creams from the attractive little village store. Heading back along the footpath the route passed over a cricket pitch and across a couple of paddocks surrounded by an electric fence. At first there seemed no clear way through as there appeared to be no gates but the fences were not electrified and could be lifted up to allow our passage. 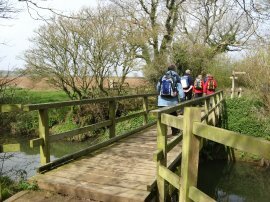 The path then headed slightly to the left along a rather muddy track, past a farm building and across a bridge over the Cuckmere River again, close to the grounds of the moated Michelham Priory although they remained hidden from view. 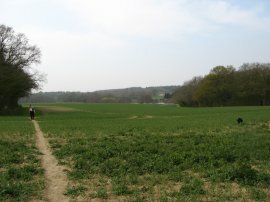 The route then bears to the right to head over a number of fields, photo 5, towards the A22. 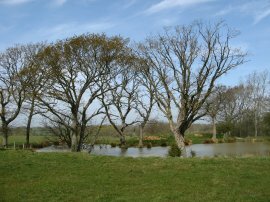 On the way the Wealdway passed a number of very attractive tree fringed ponds in the fields, photo 6, pleasant walking in the morning sunshine. Having crossed the A22 dual carriageway the route heads over a couple of fields to the outskirts of Hailsham. The path runs along the back of some houses and then enters a new housing estate where the signposted route was blocked by a tall green metal fence. After a little deliberation this meant a slight detour as we more or less had to double back on ourselves through the houses and down along a short stretch of the B2104 to cross over the A271 where we rejoined the marked route of the Wealdway close to a very run down Horsebridge mill, photo 7, which had ceased operating in 1969. 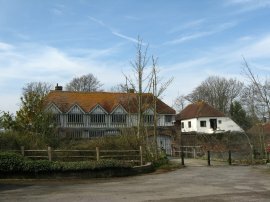 The path continues ahead alongside the Cuckmere River to cross the driveway of the moated Horselunges Manor, photo 8, before continuing a short distance up to a road where the route turns left to enter the vilage of Helllingly. Here the route passes through the churchyard of St Peter & St Paul, Hellingly, photo 9, which is where we stopped for lunch. 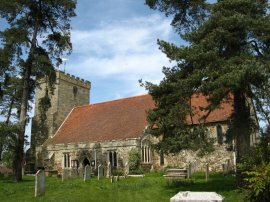 The church was surrounded by a very attractive churchyard, part of which was surrounded by houses which faced onto the churchyard, photo 10. Whilst I was eating lunch I spotted a tree creeper making its way up the trunk of one of the tall trees in front of the church, the first one I had seen for about a year. 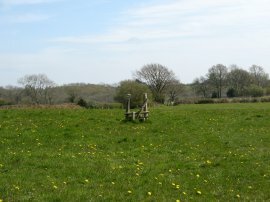 The Wealdway follows the road out of the village, turning left at a road junction and then taking a footpath over a field that runs down to cross over the A267. 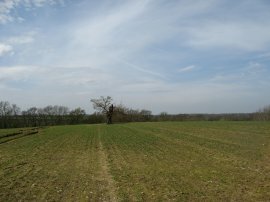 After another brief stretch of road walking the route starts gradually heading due west as the Wealdway makes its way over fields in the direction of Chiddingly. At the start of this section of the walk the path passed through a field containing all sorts of unusual items including amongst other things a boat and some stone mushrooms. 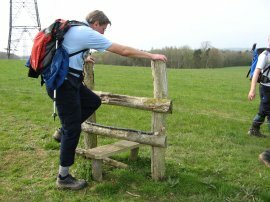 The route then passes through a small stretch of woodland before heading out over the fields, photo 11, one including a now redundant stile, photo 12, past Rock Harbour Farm and along to join a road near Gun Hill. 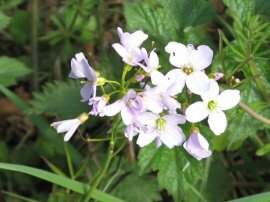 In one of the fields I took the photo of the plant in photo 13 although at present I have not been able to determine what it is, (now identified as a Cuckoo flower). 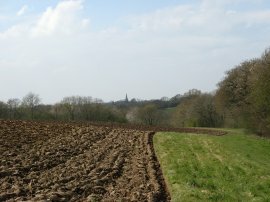 At a T junction the Wealdway continues straight ahead across more fields towards Chiddingly, its location marked by the prominent church spire on the horizon, photo 14. 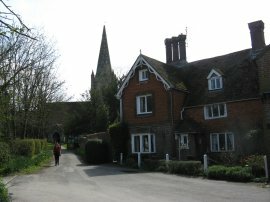 Reaching Chiddingly, photo 15, the route turns right onto a road that runs past the the church, briefly linking up with the route of the Vanguard Way for one final time. 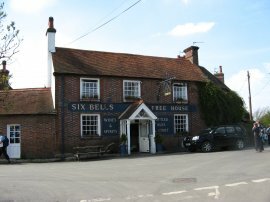 The Wealdway follows the road round past the Six Bells Pub, photo 16. 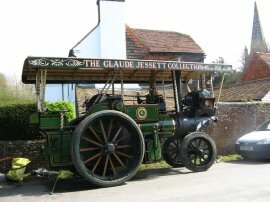 Opposite the pub was a traction engine parked up, photo 17. 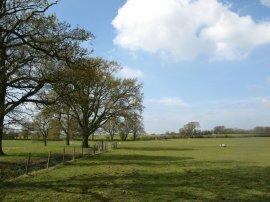 The route continues along the road out of Chiddingly before heading to the left across fields towards the village of East Hoathly, photo 18. 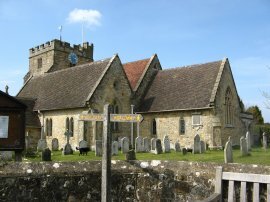 East Hoathly Parish Church, photo 19, is in the middle of the village, just off the high street down Church Marks Lane. 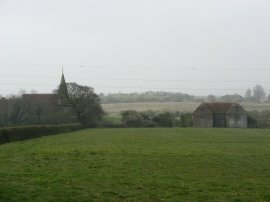 The route passes through the churchyard in front of the church and continues along out into more fields. Reaching a road the Wealdway heads up the driveway of Hesmonds Stud farm and then along a broad grassy path towards Great Wood for another stretch of pleasant rural walking, the fields ocasisonaly interspresed with small patches of woodland and bluebells, photo 20 and with even more stiles to cross, photo 21. Leaving the wood the path heads towards an isolated tree in the middle of a field, photo 22, before turning to the left and heading gently downhill to pass through a small patch of trees and over a wooden bridge over a small stream. 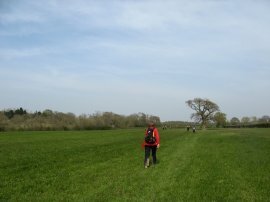 The route crosses Beechy Road, where for a while the group split into two with some taking the direct, and correct, route across a roughly ploughed field, while the others opted for a slightly longer, but far more gentler on the knees, trip around the field edge. The route then headed steeply downhill to cross another very small stream and continues on to briefly join Bushbury Lane before turning to cross over the B2192 and heading over more fields towards Pump Lane, photo 23. Reaching the road the Wealdway turns to the right and heads up the driveway through the impressive grounds of Newplace Farm which I followed after a short erroneous detour along Pump Lane!! From here it was just a short walk gently uphill past the edge of Newplace Wood and on over fields to join the B2102 in Blackboys, photo 24, where this stage of the Wealdway finished. At the end of the walk my GPS showed a total distance of 14.7 miles, Sara's 16.1. I somehow feel her distance was the more accurate of the two! 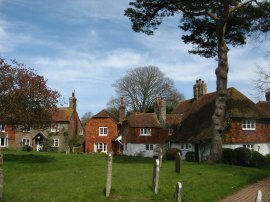 Almost all of this had been along the Wealdway itself and we have now already made considerable progress away from the Sussex coast. 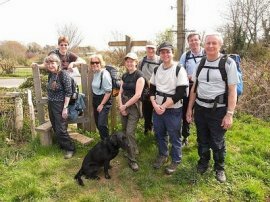 Photo 25 show the group who did this stage of the walk, sadly missing Anne who was taking the photo!